The Centre for Investigator Training ( CIT) is part of the School of Applied Policing within the People Development (Education) Department. We are a Registred Training Organisation. CIT was previously known as the Detective Training School ( DTS ) within the Victoria Police. DTS was established in 1939 and previous heads have included the likes of past Chief Commissioner the calibre of Mick Miller. This Centre has the primary responsibility of training Investigators who to qualify must obtain an Advanced Diploma of Public Safety ( Police Investigation). Two of the ten Units of Competency that students must complete include “‘Develop productive working relationships” & “Liasie with other organisations. The performance criteria, range statement and evidence students require to satisfy in these units of competancy lends itself for engagement with Community groups, local disadvantaged support groups, non-government agencies, and volunteers. Detectives interact with many and varied organisations, internal and external stakeholders and are required to develop and maintain ethical, professional working relationships. CIT in a recent re structuring of its DTS course has developed the critical first two days of its course to now include Problem Based Learning ( PBL) method of learning, creating an Investigative problem for the student syndicates to work through. The problem involves a child and bicycle. Throughout the problem solving of these two days the bicycle becomes more a focus as they work their way through clues ( bike parts ) with the syndicates in teams building the bicycle. The bicycle (s) after the investigation, becomes the focus, whereby students choose an organisation, establish the relationship, engage with them and donate the bicycle. 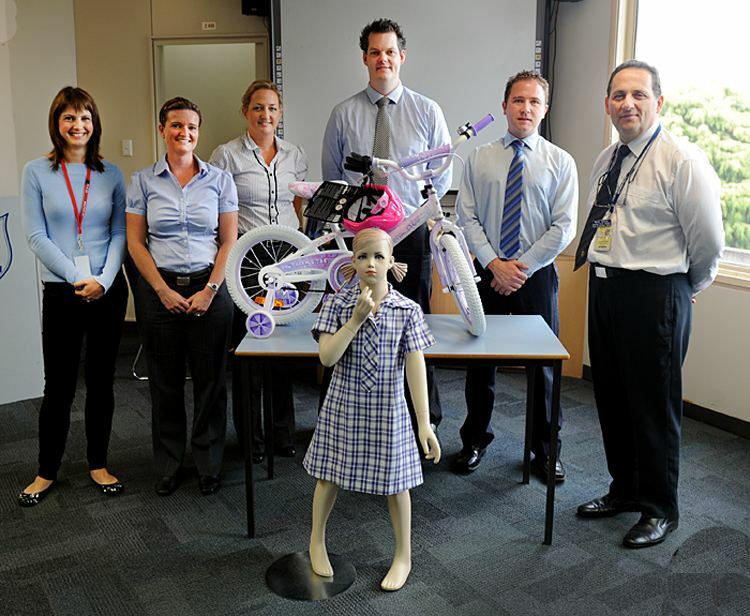 In this course, due to Detective Senior Constable Dave Daly having a family connection with someone who is affected by Muscular Dystrophy, the thirty students overwhelmingly decided that Muscular Dystrophy Australia was the organisation the bike would go to. The Centre for Investigator Training, Detective Training School Course 228 B was pleased to present MDA Client Services Manager Marie Fleming and Executive Director Boris M Struk with the bicycle and helmet. l-r – Marie Fleming MDA, Detective Senior Constable ( Det S/C ) Sharon Eyre, Melboure Criminal Investigation Unit (CIU), Det S/C Heidi Edmonds Melbourne Sexual Offence and Child Abuse Unit (SOCAU), Det S/C Mark Weber Ballarat SOCAU, Det S/C Dave Daly Melbourne Drug Taskforce, Det Sen/Sgt Nick Vallas Centre for Investigator Training.